Sean Connery and Catherine Zeta-Jones do their best at being the millennium-edged twosome in the style of Cary Grant and Grace Kelly, sadly without Alfred at the helm. What FX and modern technology offer us do not make up for a good tense tightrope of nerve-grinding suspense. Throw as many celebration light bulbs in as you will and it still doesn't make you experience the danger (especially when such incomprehensible antics include climbing unnoticed past an armada of armed destroyers in the niche of a sky-bridge constructed completely of glass walls. Or are these sharpshooters blind?) The big question remains: who is ultimately entrapped? Robert MacDougal (Sean Connery) is a notorious (thanks, Hitch) art thief. A stolen Rembrandt appears to lead Virginia Baker (Catherine Zeta-Jones) to his doorstep (or should I say moat?). Gin, as those who know her refer to her, is an insurance investigator for a firm that is trying to avoid paying out $24 million for the theft. Posing as an "undercover" thief, she passes herself off on Mac as a desirous accomplice to capture a priceless mask in Kuala Lumpur. Sort of like "Topkapi" goes underground. Ving Rhames, as Mac's accomplice Tribadeaux, is good at playing good and bad. 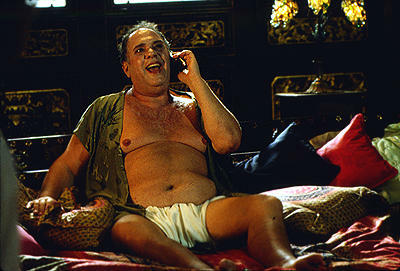 Maury Chaykin, as black marketeer Conrad Greene, shows how coarse and tasteless the underworld can be on a hot day in paradise. Will Patton, as the disgruntled insurance head, pops up unexpectedly now and again to remind us that these main characters are not necessarily to be trusted and that lead roles are not always given to people with good morals or proper ethics. Jon Amiel, director of "The Man Who Knew Too Little", brings us this interlude as a cross-section between an almost romantic international romp with a special Kodak moment between thieves. Sean Connery also produced this running chase which was originally pitched to him in seven lines. He viewed it as "a good yarn with wit, and an intriguing romantic element that puts a real sting in the tale. It's like a Peking Opera - each character has a different agenda from the one they initially appear to have." Well, Sean, what can we shay? He also found Catherine Zeta-Jones to be more than perfect for the female lead. "Catherine is game for anything you throw at her. She's a total professional who is willing to go all out for her role." Zeta-Jones goes with grace from one mask (Zorro's) to another (a golden bejeweled treasure) without getting hung up or strung up as she makes the moves of a determined ballet acrobat between laser twists and turns in a crazy cat's cradle museum. She views the electric results of working with Connery as similar to those found between Hepburn & Tracy or Bogart & Bacall (no mention from her lips of Grant & Kelly). Amiel's direction and the scenario of Ron Boss and William Broyles are (for the most part) worked out with sharp precision and realized with the perfection of master thieves in order to create a movie that, one must admit, follows the relentless path toward a conclusion. It makes for an exciting tale with a number of thrilling sequences; file away under "action" with all the others; best watched without waiting around on the platform for the last two minutes (and I don't mean the credits).